Biologico B&B is a recently restructured apartment in a little building with garden, near the centre. Poetto beach is a few minutes away by bus, car or moto. There is Internet acces with Wi Fi. The breakfast is prepared with biological food, Sardinian specialties. 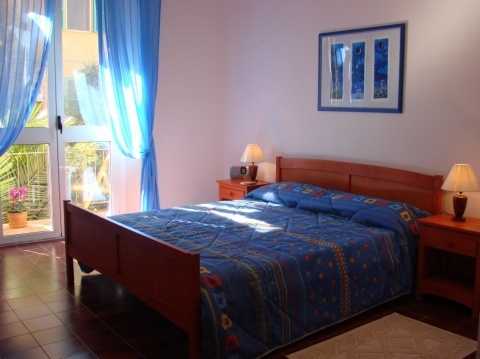 The Bed and Breakfast is located in small building with garden, in a central and quiet neighbourhood, close the Monte Urpinu park.You can reach the beautiful beach of the Poetto in a few minutes by bus, car or motor bike (parking is free). During summer, you will enjoy warm and transparent waters. During winter, you will enjoy many typical plates from Sardinia in the numerous restaurants located near the beach. The zone is well connected to public transportation which will bring in any part of the city in a few minutes. There is Internet acces with Wi Fi. The breakfast is prepared with biological food and Sardinian specialties.